Today’s endangered animal has been discussed on RT in the past. In fact, it was one of the first 5 posts when this series was started. I would like to revisit the species today to shed some more detail on this unique creature dubbed “the panda of the sea” because I came across an article that just makes me so sad for it. Vaquita (Phocoena sinus), also known as the Gulf Porpoise can only be find in Mexico’s Gulf of California. Although this species lives primarily in the sea, it is a mammal which means, unlike a fish who draws oxygen from water through their gill system, it breathes air. In fact, they can be grouped with the likes of dolphins, whales, tusked narwhals and other cetaceans (scientific term for marine mammals). They can hold their breath for some time but ultimately have to come up for air like majority of mammals including humans. Vaquita are the “panda of the sea” due to the unique markings on their face. Just like a panda, around the eyes are dark rings and dark lips that curve and make the vaquita look like a smiling panda. It’s dark grey in color on the top of it’s body and pale gray on the sides. The reason they can only be found in the Gulf of California is because this area is relatively shallow water but has a very diverse marine ecology. Vaquita feed on benthic fishes, squids and crustaceans. Benthic fishes are better known as bottom feeders. They stay closer to the sea floor where there’s rock, mud and sand. Like last week’s post where I discussed a bat’s capability in using sonar, vaquita utilize the same type of sonar to communicate in the sea. Mating season for vaquita occurs in the spring time; April and May. Mature females will give birth to one offspring every two years and gestation period is usually around 10 months. 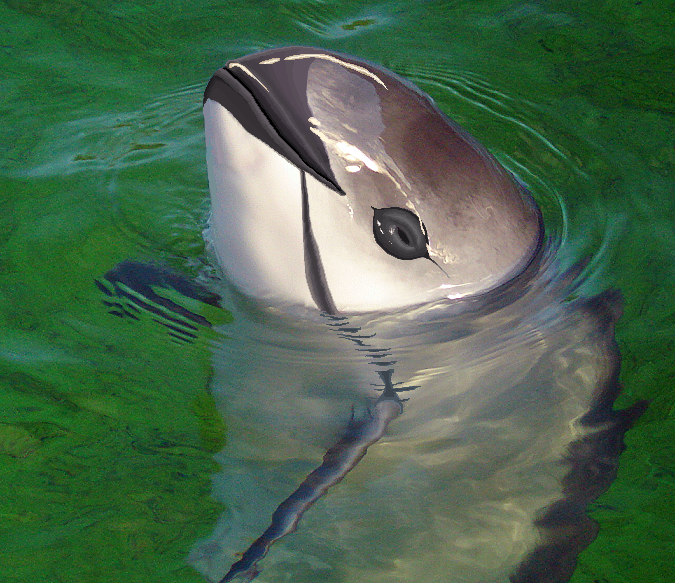 Adult vaquita average about 5 feet in length and can weigh about 120 pounds. Back to why I wanted to revisit this species, the threat of extinction has become very real for this species. As of today, there are less than 30 individuals left in the wild with extinction being predicted to occur as early as next year. Vaquita were first listed as vulnerable in 1986; just 28 years after they were discovered in the first place. By 1990, their status was upped from Vulnerable to Endangered and by 1996 they were critically endangered and have been ever since. The major threat to this species is through fishing bycatch. What that means is, fishermen are throwing out gillnets with various mesh sizes to capture other marine fish species and the vaquita get caught up in the net and drown. Ironically enough, since the mid 1970’s the fish species that was being captured is also critically endangered; the totoaba. Because of the totoaba’s status, selling them has been banned. However, that basically opened the doors to illegal trade and people still fish for the totoaba, without care for the vaquita, because their swim bladders are worth $4000 USD per pound. Because the vaquita are so critically endangered, the government of Mexico as well as many wildlife and conservation divisions of the United States have really started to try and take action to preserve the last individuals of this species. Measures even included capturing some of them into marine reserve captivity to hopefully boost reproduction numbers but the one vaquita that was brought into captivity did not survive very long. An autopsy has been scheduled in order to figure out why the vaquita died in the hopes that scientists and conservationists can understand what they may be doing wrong. At this point, it’s definitely a race against time. Protocols, guidelines and anything else that can be developed in order to sustain the decline of this population is going on as I type this post to you. If you’ve read this plight and would like to do something to help this species, you can always donate to the World Wildlife Fund or adopt a vaquita at Porpoise.org. I know right. Money makes people so damn cruel. Oh my gosh! I can’t believe there are only thirty left. That is alarming! I’m so saddened that they can’t figure out how to help them produce either. They are such beautiful mammals. 😢 I can’t believe its predicted that they’ll be extinct that quickly either. 🖤 It’s heart-wrenching. Thanks for sharing this, Nel. Same. 😦 That’s why I felt the need to bring it up because man 2018 is just around the corner! I really hope it all gets figured out soon. Cute, in the picture it looks like it has a smug I-know-something-you-don’t-know smile. This is just tragic. Dragnets and their ilk kill so many creatures unnecessarily. Yeah 😦 Humans can’t seem to get a clue. We, as a race, are truly horrible to our home planet. Indeed. But hey, Mother Earth always bounces back. We’re probably a blip on her radar. Oh my goodness. We humans need to get a hint. We are destroying our world. I had never heard of this species before. Thanks for sharing again. You’re very welcome. I agree! We definitely need to change a lot of our habits where destroying the environment is concerned.